Boulder City girls basketball coach Paul Dosch was glad to see the first week of competition come to an end. The bus will be a familiar home to the Lady Eagles, who lost their only home game of December to Foothill 54-48 on Dec. 3. Their next home game is Jan. 9. The Lady Eagles are 4-3 after the opening week, but for Dosch and some players it was too grueling of an opening week. After a road win at Western got the Lady Eagles on the winning track, they lost to Foothill and then played four games in three days in the Lake Mead Holiday Classic. They were 3-1 in the tournament, suffered a few minor injuries and then on Monday were beaten 48-34 by Division I Basic on the road and lost starting guard Alyssa Ybarra because of an injury. Ybarra twisted her left knee at the start of the fourth quarter and was helped from the court. Her status is day to day and she could miss the Lady Eagles’ Sunrise League opener at Del Sol Monday. It was a tough test, playing seven games in eight days for the Lady Eagles. Dosch’s first season as coach a year ago ended with a 24-5 record overall and 11-1 in the Sunrise League. The Lady Eagles were the No. 1 seed in the playoffs, won the Southern Region championship and advanced to the state championship game. They have made the playoffs in six consecutive years and 15 of 16 years, missing only in 2008. “This team is still trying to find its chemistry. We have a few returning players, some new players and a tough schedule. Right now, we can’t find our defense,” Dosch said. “We are slapping at the ball rather than making defensive stops. Dosch scheduled Division I teams like Foothill and Basic because they are area rivals and larger schools that will give his Division I-A team some tough competition. Basic held the Lady Eagles scoreless in the first quarter, taking a 10-0 lead. The Lady Wolves extended that to 19-8 at halftime and to 27-11 after three quarters. Boulder City only scored 3 points in the third quarter. 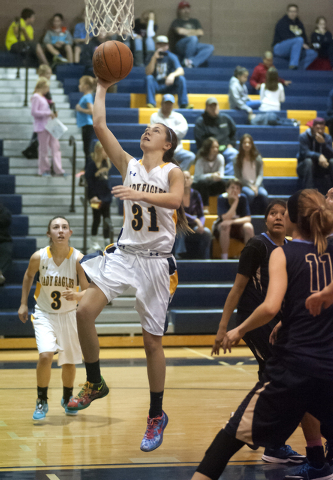 Forward Megan Morton led Boulder City with 15 points and Katlyn Daly scored 13 points. The Lady Eagles scored 23 points in the final period. In the Lake Mead Holiday Classic, Boulder City defeated Calvary Chapel 56-20 Dec. 4. 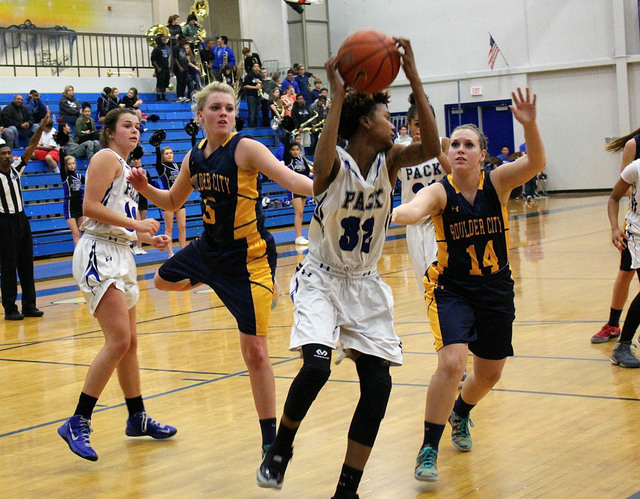 Morton scored 17 points and Lauren Mullins added 10 to lead the Lady Eagles. On Friday, Boulder City beat Pahrump Valley 38-21 behind Morton’s 13 points. Sam Hanson scored 8 and Ybarra added 7. The Lady Eagles lost their second game of the day 48-42 against Australia’s Haileybury College. Morton scored 13 points, Daly had 11 and Ybarra had 10. In Saturday’s final round, Boulder City defeated West Wendover 64-33. Morton scored 15 points, while Daly added 14, Ybarra had 12 and Jewels Worrall had 7 points.